And to common folks, with loose lips. But we do respond to commoners with loose lips. The main issue is not to ask a friend how they are doing, although it’s unclear why. 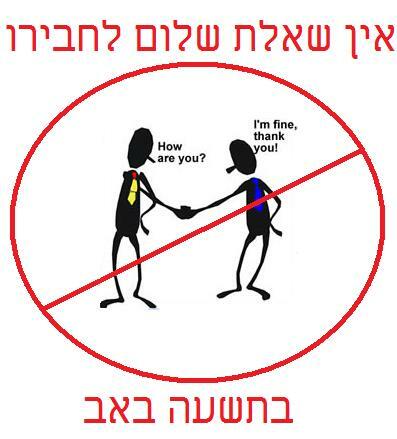 However, it does not say that greeting them (אמירת שלום) is altogether forbidden. Perhaps these add up to a sense of sadness, although not ignoring the other person. These lead into the other part of the statement in dealing with common folks, from which we glean that you are not supposed to ignore them, but also not answer them as if it were a normal day. I wonder why the Tosefta and Yerushalmi do not phrase it to forbid the saying of hello, but – instead – forbid the inquiry of someone else’s wellbeing? Could it be because of course you can say hello, but asking as to someone’s welfare might draw someone away from the spirit of the sadness of the day or not fit in with the spirit of the sadness of the day? This damper on interpersonal communication as to their welfare can certainly enhance the sadness of the day – not only not being able to find out from others how their lives are going, but also not being asked for one own’s personal wellbeing.